Orangepip gives a zest for Making! Orangepip provides a colourful introduction to coding and prototyping – including the popular ATmega microcontrollers, these boards give programmers a zest for learning! The three Orangepip boards are similar to the Arduino Uno and Mega, using the same microcontrollers, GPIO pins, serial ports and 16MHz oscillator, and compatible with most Uno and Mega shields. But what software can be used with the Orangepip? No need to worry. Both the Mega2560 and Kona328 are fully compatible with Arduino IDE, which runs on Windows, Mac OS X and Linux. 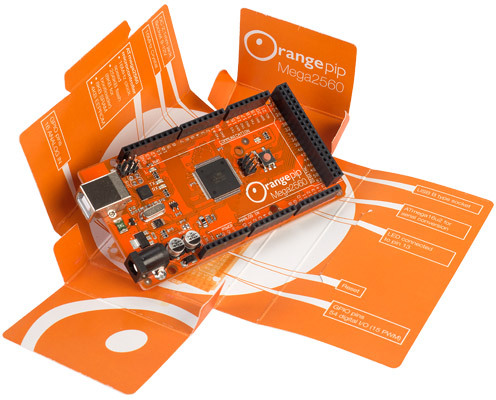 See your projects grow with OrangePip – a distinctive new range of open source boards which offer a colourful introduction to coding and prototyping. Based on the ATmega2560 and ATmega328 microcontrollers, the OrangePip boards are fully compatible with Arduino shields, sensors, accessories and software – giving users access to the global Arduino community of makers and projects. The boards themselves are rich with features, including 16MHz oscillator, ATmega16u2 for serial conversion, 14 digital GPIO I/O pins (Kona328) and 54 I/O pins (Mega2560), quick reset buttons and machine screw holes. The high performance ATmega 8-bit AVR RISC-based microcontrollers give OrangePip users enough power and memory to store and run multiple lines of complex code – the Kona328 and Segments328 being designed for beginners and Mega2560 for intermediate users. The Orangepip Kona328 is an Arduino UNO compatible development board that is based around theATmega328 microcontroller. The board features 14x digital I/O pins (six of which may be used as PWM outputs), 6 analog inputs and a 16MHz crystal oscillator. The board is simple to use, just requiring connection to a computer via USB to get started. 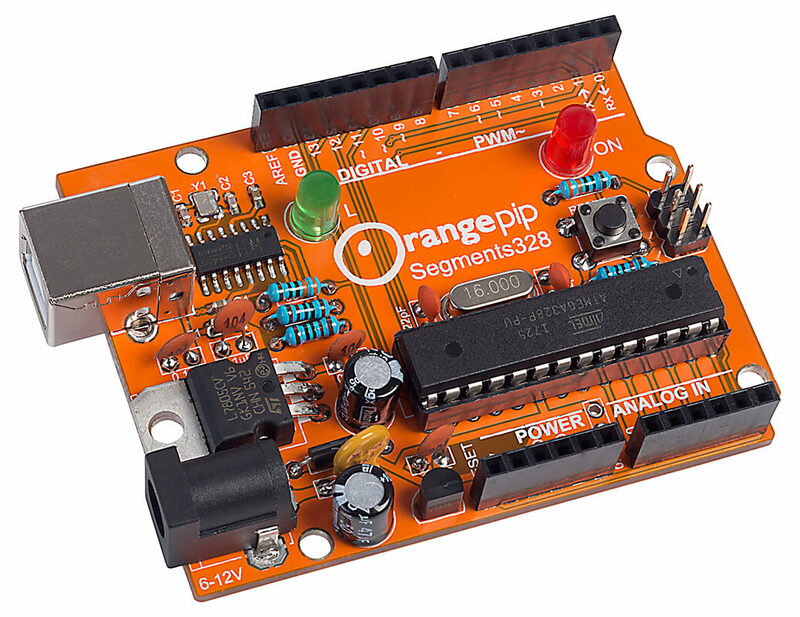 The Orangepip Mega2560 is an Arduino Mega2560 compatible development board that is based around theATmega2560 microcontroller. The board features 54x digital I/O pins (14 of which may be used as PWM outputs), 16 analog inputs, 4x UARTs (hardware serial ports) and a 16MHz crystal oscillator. The board is simple to use, just requiring connection to a computer via USB to get started. 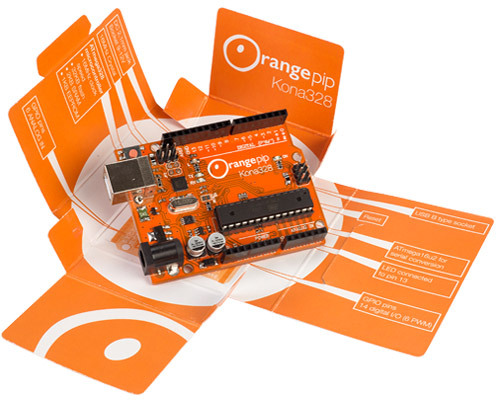 The Orangepip Mega2560 is also compatible with most of the shields designed for the Arduino Mega2560. This Segments328 kit is a ‘build your own Arduino kit’. It includes all the through-hole components required. Just follow the easy-to-understand instructions to produce your own fully-programmable open source prototyping platform. Its ideal for Makers or students who want to increase their understanding of how Single Board Computers work and develop their soldering skills at the same time. Where can I buy Orangepip products?